The EX-FS10, which was at the International Consumer Electronics Show, is 16 millimeters thick but can manage burst-shooting at up to 30 frames per second and high-speed movies at up to 1,000 frames per second. The high-speed picture mode allows for all sorts of neat tricks, such as the ability to shoot a bunch of pictures in close succession and then pick the best shot while the high-speed movie mode produces a super slow-motion effect when the video is played back at normal 30 frame per second speed. 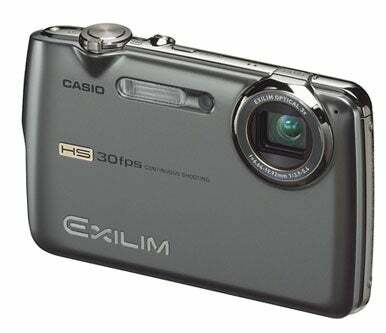 A companion camera, the EX-FC100, also offers the functions and is slightly thicker at 22 millimeters. The FS10 has a 3X optical zoom while the larger body on the FC100 accommodates a 5X optical zoom. Both cameras shoot at 9.1-megapixel resolution and will go on sale in the U.S. in March. The FS10 will cost $350 and the FC100 will cost $400. Casio launched the first cameras in its high-speed range at CES last year. The dramatic reduction in size over the last 12 months has been helped in part by miniaturization of components inside the camera and the combination of several chips into one. The circuit board inside the cameras is less than half the size of that in the original F1 model.